I just wanted to say that I really like what you're doing with the hack. Keep up the good work! And thanks to all of those that have helped along the way! I'm not in town at the moment, so I can't try out the link you posted @njosro, but from what I can remembee, I think i tried that one past thursday and I couldnt get the Loto reference to pop up. Can anyone try that one and let me know if you can, please? If someone does have the latest Redux patch with the Dragon quest reference at hand, please post it here just in case. I won't be able to test anything until Monday, but any patch/help posted would be amazing. This is one of the most beautiful hack I've seen so far on a Zelda game . I can't wait to see the result of the final patch . Thank you so much to everyone working hard on this project ! Mmmm okay I had to re-implement the Dragon Quest reference for the version I had, since I couldn't find the patch that already had it. Btw, to restore the reference, it takes nothing more but a 2 byte change in the ROM, just so you guys know . To manually restore the Dragon Quest reference, all you have to do is go to offset 0x00C8E9 and put [7B 8C] in there. 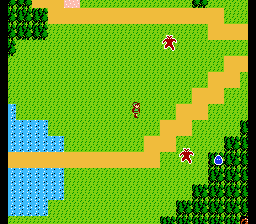 (At least for Redux, I'm unsure if this works for vanilla Zelda 2 as well). What's included in this beta? Overworld tile animation. Right now, water, grass and the River Devil are animated. I might animate the town tiles too, but I'm still seeing what might work best. Dragon Quest reference name changed from Loto to Erdrick. I also had to repoint the text to make room for the bigger name. Icons for levels on Save Selection screen and HUD changed. I changed the Sword icon to a more decent one, and also changed the Heart (which corresponds to the Life level up) to something like a Shield, since that levels up your defense. I am thinking of maybe redoing the Sword to be more similar to the one in the boxart (like Rev's hack does). And maybe changing up the HUD to something akin to Shadow of Night, but let's see if I end up doing that or not. Please, let me know if you find anything odd or out of place with this beta, as I'm unsure if the Dragon Quest reference was the only thing missing from the build I had. Also, how's this for a little spicy change to the overworld enemies? I tried to grab the best of both the japanese and english releases, and came up with this. This way they don't look as bland blobs like in the Japanese release nor as bland in color as the English one, so now each one has their palette colour and unique sprite, merging the best of both releases imo. Let me know what you guys think, I am really opening up to the possibility of touching up slight parts of the graphics. Btw, I think I can also add more animation to the enemy/fairy sprites on the overworld as well. That can be somewhat easily fixed. What hack are you applying first, Redux or Rev? I need to know in what order you are applying them, so that I can give you the proper instructions on how to fix them. Should be what I have of Redux so far, alongside Rev Edition v1.6 and the New Link sprites. The New Link Sprites patch is only for the new title screen (which I think is the most beautiful of all), because the Link design that will prevail is that from the Rev Edition. In fact most of them (overworld, monsters, items, npcs, menus, cities, palaces, etc) will come from the Rev Edition. Would it be possible to get Rev Edition updated character sprites instead but keep the New Sprites title screen by applying them in a different order do you think? But that's exactly what this patches order does, if you want the New Sprites title screen, this should always be applied last, otherwise it will always be that coming from the Rev Edition. @Trax - Is there a way to change the order in which you get magic? For example, is there a way to put reflect magic in Western Hyrule in the 1st town Rauru and get the Shield magic in Eastern Hyrule? I've been trying to find a way to change the order you receive magic, but I have been unsuccessful. @ShadowOne - Great work with the hack. Now if someone can figure out how to change Jump magic to do a double jump instead of just jumping higher, that would be awesome. Isshh... Spell learning seems to be linked to Town Code, RAM $056B. Switching Town Codes within the same region is easy, but between regions, I'm not sure. It could break other game mechanics. Is there a way to change the Magic level requirements to learn a spell? For example, Fire and Reflect require your magic level to be at 4 in order to learn the spells. Can it be changes to 1 or 2 to learn them much quicker? Well, the code says that you need as many Heart Containers as the rank of the spell, which corresponds to the Town Code, plus one. Town Code for Rauru is 00, so you need 1 Magic Container to get the Shield spell. So on, up to Thunder, which requires 8 Magic Containers. Town Code for Kasuto is 07. EDIT: Magic Containers, not Heart Containers. do you mean magic container trax ? Is there anyway of changing that formula so I can do something like make you get the Reflect spell 1st instead of Shield Magic?